An eye examination should be performed by an eye doctor. An eye doctor is either an optometrist or ophthalmologist. An eye doctor must be licensed in his/her state according to regulations by each optometric or medical state board. 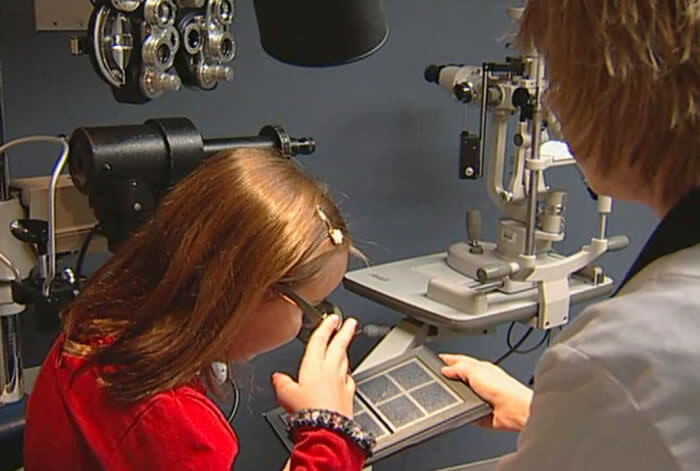 An eye doctor will perform tests as part of an eye examination. An eye examination will give a diagnosis (e.g., normal, myopia) and prescribe treatment when indicated (e.g., glasses, vision therapy). Measurements for eyeglass prescriptions is also done. This is called a refractive evaluation. Refractive errors include nearsightedness, farsightedness, and astigmatism. Vision screening does not evaluate eye health and important vision skills needed for success in school, sports, driving, and the modern workplace. Vision screening is not a substitute for an eye examination by an eye doctor. The Vision First preschool report form (for 3 and 4-year-olds) and the student report form (for grades K-12) were created solely for eye examinations by an eye doctor. The Vision First report form exceeds state standards. Increase understanding of a child's visual abilities and eye care needs. Ensure a child's success in school. The demands for reading and writing are occurring at an earlier age for children. Parents and teachers depend on the eye doctor's eye examination to identify, treat, and prevent vision problems that could interfere with a child's ability to succeed in school and in life. All children can benefit from a comprehensive eye and vision examination. The Reference Page explains the Preschool and Student Comprehensive Eye and Vision Examination Report. The Vision First report form and Reference Page were created for the parent and teacher. When submitted to the child's school, the Vision First report will assist a child's teacher in providing an excellent educational program for the child. This resolution led the IFT to initiate legislation, Senate Bill 641, requiring an eye examination for all children entering kindergarten as a necessary prerequisite to academic learning. "Vision First Foundation congratulates the Illinois Federation of Teachers under the leadership of Sharon Teefy, legislative director, Jane Russell, president of West Suburban Teachers Union Local 571, and chief sponsors Senator Deanna Demuzio and Representative Jil Tracy for initiating and ensuring the unanimous passage of Senate Bill 641. In cooperation with the Illinois Optometric Association under the leadership of Michael Horstman, executive director, this huge accomplishment will greatly benefit all children entering kindergarten in Illinois. Your outstanding efforts in raising the standards of eye care for our children's visual welfare are commended!" Protect your vision. Have your eyes examined by an eye doctor every year.